Goodwood motor racing circuit was the venue for my first race in three months. OK, I realise that 26.2 miles of tarmac don’t exactly amount to off road but the location is only 35 minutes away and the track is such an iconic venue. This initial photo is my favourite from the day. The historic Goodwood start/finish straight, Stig (possibly not the real Stig), Paul from Fareham Crusaders and Gosport road runners Steve, Catherine, Claire, Lisa, Katrina and Hayley. With numerous other RunThrough uk races scheduled for the day our marathon started at 9am in pleasant conditions. The pre race warm up set the tone for a light hearted day running within a fairly small field, but a very supportive one. This photo from the warm up shows my friend Hayley adopting the New Zealand hakka, me clinging onto an imaginary bar above my head (for what ever reason) and Paul (the Brad Pitt lookalike) talking on his imaginary phone to his imaginary PR agent 🙂 Yes we were all raring to get started !! Before the off there was just time for mine and Paul’s trademark photo with the motor racing pits behind us. The prospect of 11 laps might have put some people off, however, I was keen to use it as a good mental test. I spotted local blogger Anna who eventually placed as first lady in 3.26 and radio/running personality Vassos Alexander who finished in 3.22, the checked flag dropped and we were off. Each lap of the track was about 2.4 miles and it varied with some gradual inclines and declines as well as the wind direction blowing across, in front and behind you. What I hadn’t considered previously was that there’s an aerodrome in the middle of the track !! A good thirty or so light aircraft and helicopters were parked up with quite frequent arrivals and departures. I have to say the first time a plane landed above our heads it was quite amusing and quite close !! With 11 laps there was only the need for one feed station but I was impressed with the number of marshals around the course who offered continued support on every lap. RunThrough had placed speakers to play uplifting music and then totally out of the blue two gentlemen in Mexican attire, complete with guitar and trumpet, added to our entertainment. With there being a number of races held through the day we were regularly lapped or saw runners coming towards us. This did break up the day and it was great to see Andy Paton from Liss Runners charging along on his 10K. There were various motivational signs around Goodwood, with one that read “keep to the racing line” which I wasn’t totally sure was for us but again it made you think as we ran the twists and turns of the track. I chatted with Hayley on my first lap and then later with Claire and Joanne. The support from the grandstand was a real boost but for the remainder of the time it was largely “you and your thoughts”. One of the joys of running for me is to completely switch off and simply observe what’s around you. The South Downs in the distance, the aircraft and even the wind on your face or the sun on your back. Running is definitely my mindfulness. Pace wise I stayed around ten minute miles but drifted slightly once past 20 miles. The mile markers were dotted around the track in reverse order which personally I wasn’t sure about but it did motivate me when it said 5,4,3,2,1 miles left !! Both Paul and Hayley were a lap ahead of me and Anna must have lapped me twice but I only remember seeing her once 🙂 #oldage !! I have to say I walked a few times on lap eleven due to a lack of training but with the marshals encouragement, the sight of the finish line and the ever supportive Gosport ladies, this was enough to carry me home in 4.42 which ultimately was a fair time for the day. Yes, I do look quite knackered but I achieved what I came for i.e. to get back on track and Goodwood was certainly a great place to do it. One thought for the future …. the water came in the form of endless single use plastic bottles. It seemed such a waste with piles of them, some only half empty, scattered around the course. Naturally that also meant they needed picking up as well as going against the single use of plastic that’s becoming more frowned upon #savetheplanet. I liked this board …..”You will never win, if you never begin” it might not have been a quick time compared to the Berlin world record but I think all of us that entered should be proud of completing what is still the benchmark of distance running. Thanks to RunThrough uk for a well organised day in a great location and an impressive t-shirt and medal. Happy Running everyone …………. thanks for reading and see you at the Isle of White marathon in four weeks. When you set your alarm call for 5.15am you know it’s going to be a long day but more importantly you know you’ve committed yourself to a challenging day. What’s life without challenges ….. boring !! Running along the South Downs Way guarantees you amazing views of the countryside that haven’t changed a great deal for decades. 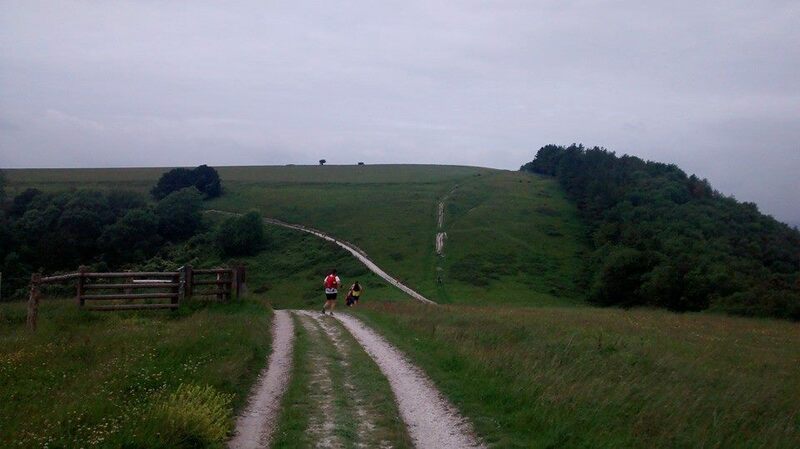 Time stands still on the Downs and that’s why trail runners love it, what you can’t avoid are the hills. Some 3,000 feet of elevation awaited us. 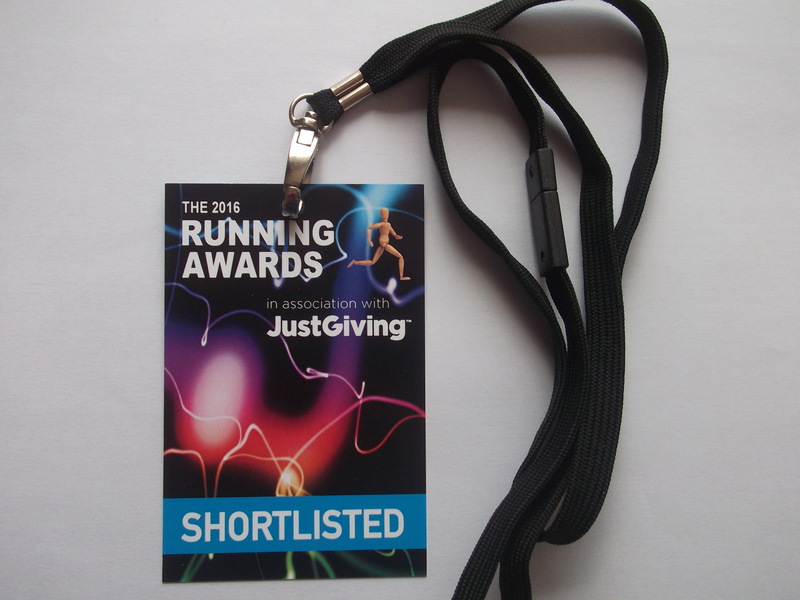 This will be my second marathon in three weeks after the great Dorchester marathon. With Slindon college being our starting point 209 Events had organised coaches to drive us from the finish at Queen Elizabeth Country Park (QECP) to the start. I boarded our coach with Fran and Rachel from Fareham Crusaders who also ran the Dorchester marathon three weeks previously. I offered a few thoughts from running the race in 2015 and as we arrived there were menacing clouds above the college. We quickly bumped into Hayley from Gosport Road runners and Emma Bird from Pompey Joggers. Emma has reached the dizzy hights of a 100 mile run and Hayley has been accumulations a few marathons recently. Completing the line up was Mark Highland who I’d met for the first time last week. The first task of the day is to work your way up onto the top of the Downs, this combines four miles and nearly 500 feet of climbing. I spotted both Hayley and Emma ahead of me on the initial country lane but as we started the climb they eased away. The contrasting open field tracks and oppressive humid woods meant for an interesting introduction to the day. I’ve learned that if you need to walk three miles into a marathon it doesn’t mean you’ve failed it means you are spreading out your energy. Once onto the Downs the familiar chalky trail with flint stones poking out at random intervals meant you do need to keep half an eye on where you’re running as well as marvelling at the views for miles. Talking of views the South Downs don’t need arrows to signpost a hill, you quite simply can’t miss them. This beauty just kept giving and giving at around 7 & half miles. I couldn’t resist stopping for a second to take this photo. Runners disappearing over the horizon as far as the eye can see. The camera may not show the gradient quite so well but this is another 300 feet or so. Hill two on the profile below. With ten miles fast approaching my drinks strategy of 500ml an hour was going well due to the humidity as much as the sunshine. The half way drinks station offers a bitter sweet mixture of refilling your drinks and the prospect of the third big hill in the distance. I took this photo a little too early but the trail ahead winds its way up the lighter green fields towards the horizon that isn’t forested. Setting off on this third hill I knew half of it was tarmac and the remainder harder going rougher trail. Course knowledge can be invaluable on these occasions. I made the most of the tarmac and used fast walking where appropriate. At this point I think its worth pointing out that walking can actually be quite constructive. I eat my energy bar and collected my thoughts as to what remained, as well as the pace I’d need to finish under five hours. The next section between 17.5 and 20 miles has a steep grassy hill followed by a shorter chalk hill that’s very rough underfoot. These 2 1/2 miles would go a long way to what my final average time was. These are hills where everyone around you is walking, everyone is grimacing and there’s very little talking. A fast walk can be quite effective and I overtook a few runners. Leaving the 20 mile National Trust Harting Down feed station I had again used the walk to calculate what I’d needed to do on the undulating smaller “cheeky” hills that remained. Timing wise I was ahead of schedule and there was still the bonus of the last mile being largely downhill. The last 6,5,4,3 miles did hurt but I was gaining in confidence and emotion because 2015’s 4.58 looked very achievable. At mile 25 we reached the glorious downhill into QECP !! I crossed the line in 4 hours 52 minutes which I was very pleased with. My SKINS socks had done me proud on my first marathon wearing them. For a full write up on SKINS take a look on the menu of my blog. Marathons are a metaphor for life …. it’s testing, you are in it for the long haul but ultimately you get out of it what you put in. Thank you 209 Events for an emotional, hard and rewarding experience. Thanks to Emma who cheered me in after her amazing 4.19 time and to Nick from Alton Sports who I also chatted to after the finish. A huge well done to Mark with his fabulous 3.43 and Hayley with 4.37 . Equally well done to Fran and Rachel for their heroic 5.48’s on a tough course were on the brave actually entered never mind finished. It was all smiles after my second marathon in three weeks. Running off road is scenic, exhilarating and challenging but most of all it’s so rewarding. The sense of achievement to take on mother nature and come out smiling is what its all about. And finally ……….. free race photos are always a bonus !! First things first I’d like to thank White Star Running (WSR) and all the other organisations that combined to make Sunday the 27th of May such a memorable day. Running a marathon is a time consuming undertaking but planning and marshalling one inevitably take a lot longer !! Why do I sound so enthusiastic about the whole thing I hear you ask, well, for a variety of reasons the Dorchester marathon was my first race of the year, “really”, yes really. The reason I chose to run in Dorset was after watching Film My Run’s video from last years inaugural race. The video was screaming WSR !! The organisation, the humour, the facilities, and the trademark lovestation. During the hour and a half drive from Hampshire to Dorset the skies gradually moved through the colour spectrum between blue and black. Some 20 miles away from Dorchester the heavens opened and my windscreen wipers were going ten to the dozen. However, the running gods were kind to us because within ten minutes of the start I was hurriedly applying sun cream to my arms, legs and face. I spotted Andy Palmer “Mr WSR” just long enough before his safety brief to be able to introduce myself and in no time we were lined up. As I scanned the start line I said hello to Fran and Rachel from my Fareham Crusaders and as we got going I also said hello to Emma from Gosport Road Runners (GRR). hysterical fancy dress costumes a number of runners had on. As we turned left out of town I could see Richard Law from Gosport Road Runners. We’d talked earlier this month about running a similar ten minute miles strategy so we ran side by side. I can only put my facial expression down to the quickly applied sun cream getting in my eyes in these initial first few miles … ha ha. Schoolboy error. The crowds along the streets were very vocal and there was a real feel good atmosphere. With feed stations every three miles we would be spoilt all day. At around four or five miles the “ever smiling” Phil Hoy from Pompey Joggers overtook Richard and I. Phil had arrived 15 minutes late and was gradually overtaking a large proportion of the field. He eventually came 90th out of 603, hats off to you Phil. The countryside lanes were starting to warm up as the mornings sun burnt off the clouds and by the time we reached the twelve mile feed station we’d also encountered our first proper hill. This next photo was taken by one of the Bournemouth Joggers and their “Under the Sea” themed pit stop. I thought it summed up the day perfectly ….. hot, hot, hot. That’s me in the background taking out one of my 500ml soft flaks. I think most of us wore as much of the water as drank it !! I’m not sure what the temperature was at that point but it was 23 degrees by the end. From twelve miles until the lovestation at twenty the country lanes wound their way through picturesque villages and crops of various descriptions. Due to me not knowing the area that’s about as much of an explanation as I can give, however, this elevation chart from my Strava does add more to it pictorially (is that a word, spell check thinks it is so I’ll go with it). Miles 16 to 20 were harsh, the breeze dropped, the humidity climbed and I have to admit to enjoying the marathon ever so slightly less 🙂 Richard had moved ahead and fellow runners were becoming much less frequent. Two lads entertaining us with their guitar and double base made for a welcome lift in spirits but it was hard work. I would compare myself to a contestant on a games show at about 19 miles because I was banking on playing all my cards on the famous WSR oasis that their lovestations are. They came up trumps, food – drink – humour – showers – toilets – music and a genuine “how are you finding it, what can we do to help you” , suffice to say I left with added vigour and almost a spring in my stride (almost), plus a litre of fluids. It’s surprising how stopping can actually be beneficial. The long gradual climb at around 21/22 miles gave me mixed emotions, it was tough on the legs but I could also see a string of people ahead of me and all of sudden the prospect of improving my overall position on hills that I’ve trained for felt like a game show host had asked me to “come on down”, yes, “the price could be right” or in running terms, I was getting my second wind. I caught Richard and a number of others, I also had the advantage of wearing my running vest so I was carrying two 500ml soft flasks while most other runners were stopping at feed stations. I could drink and run (who says men can’t do two things at once). Actually I was doing three things, I was overtaking people !!! As miles 23,24 and 25 passed with yet more undulations along Slyer’s Lane I passed Jo and two other Pompey Jogger ladies who were running in the half marathon. The final mile was downhill and then it was just a case of squeezing everything I had left out of my proverbial running sponge to cross the line, pick up my medal and t shirt and to be greeted by my cousin Jane who’d kindly come along to support with her husband Peter. We retired to the shade of the main tent and I apologised a number of times for my sweaty condition. I drank around three litres over the course and didn’t need the bathroom once, that’s a measure of how hot it was. 4 hours 41 minutes and 304th out of 603 were my vital statistics. The Dorchester Marathon did us proud. Thanks again to all the people that I’ve mentioned and any that have slipped my mind. Today has given me the confidence to enter the South Downs marathon in 3 weeks. My running buddy Paul and I travelled down to Dorset to find a sleepy Swanage. Our first sight was the sea lapping up against the beach and the second was the promise of the rolling hills that we’d driven past being our challenge for the day. Registration was at the foot of our first hill and as we made our way up to the start the scenic views had begun before the race had !! 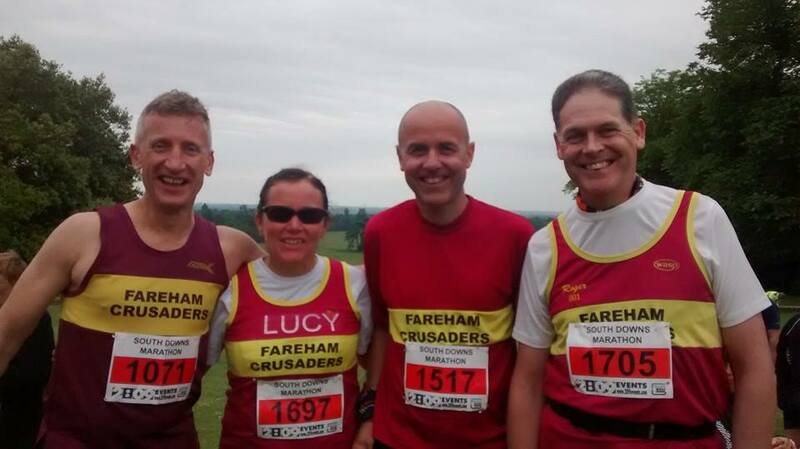 Today we were joined by fellow Fareham Crusaders Dave, Kate, Nikki and Thom as well as Dean from Pompey Joggers and Ben from Gosport Runners. Our first sight of the coast and the endless sea that really did look like it stretched out for ever was at about 1 & 1/2 miles. The lighthouse was an impressive sight but very quickly we had to concentrate on the trail ahead of us. The track was only two feet wide in places, there were numerous stones that jutted out from the soil and the cliff edge was quite often uncomfortably close !! It was certainly noticeable that the banter and chat between all the runners around use quickly changed to focusing on the job at hand. Once through the worst of the technical section the path widened out and I joined Kate and Dave queuing for one of the frequent gates and styles that are a feature of this area which combined National Trust land and military firing ranges. With better running conditions underfoot we could start to appreciate the stunning landscape more. The deep blue sea contrasted with the light blue sky and both were offset with the lush green cliff top. Our first significant hill took us inland at about five miles. As trail runners you are often presented with big hills, the accepted practise is to try and combine some running and some walking because you can be sure there will be lots more ahead !! The sheep and cows that we passed would also be a common feature for the rest of the race. A section of narrow country lanes then brought us out again onto the coast by about the eight mile mark and from then on we steadily climbed up and away from the coast. The views here were once again stunning. Another feature of this part of the area are these yellow poles that you need to stay between as they mark the route through the firing ranges !!! Thanks to Dave Fuller for this photo. Dropping down to Tyneham (a village that was taken over by the army for training purposes) we were past half way and approaching a very steep climb that lasted well over a mile. I considered taking a photo but to be honest I decided getting to the top was my priority !! Luckily Paul and Ben took a photo so thanks to them for this one. Running as a group, offering encouragement and collectively feeling the pain of our challenge meant that the miles passed quicker and in no time were approaching Corfe Castle. I have to say Julie’s constant talking was a delight, … one of Essex’s finest 🙂 and just the sort of personality that inspires you to press on. Running through Corfe village itself I lost Nikkie for a while (she stopped at a shop to buy a bottle of coke), the rest of us laughed that this was where Julie was staying for the night but she couldn’t drop out as the accommodation key was in the car at the finish. Next we crossed a railway line. Yes, that’s right, a railway line !! There’s an old steam train which runs down to the coast. “All that remained now” were miles 21 to 24 that had three long gradual hills and then we’d drop down to the seafront. The three miles of hills took their toll on me and even though I made some ground up on the downhill I joined the seafront with a likely five and a half hours finish time. In true running club tradition Paul, Kate and Nikki were waiting at the finish line and ran with me in the last couple of hundred metres shouting encouragements. I was impressed with the medal, t shirt and even a bottle of cider that came in the race goody bag. We celebrated with a burger and coffee, I thanked the runners who’d I ran with in the latter stages and on reflection our times ranged from 4.29 to my 5.33 so I wasn’t too far off the pace on a tough course. 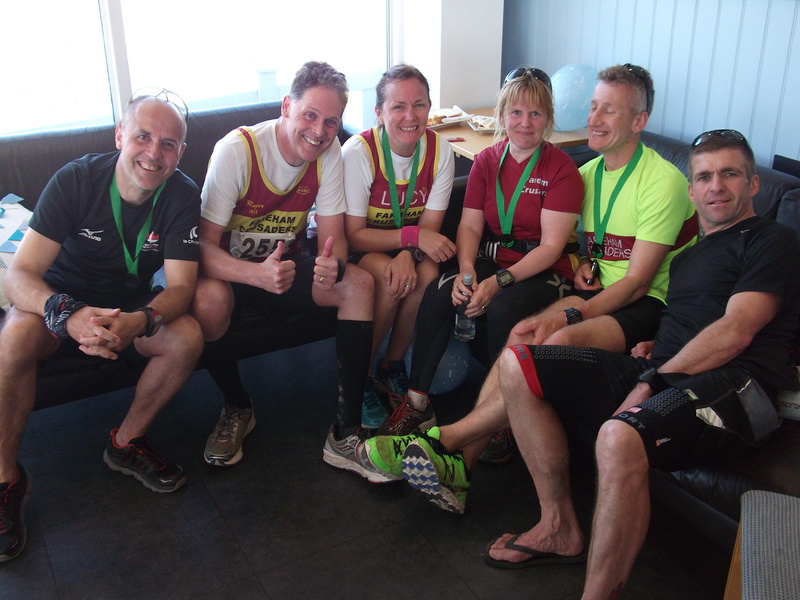 Great running by all of our local runners that headed down to Dorset. The other positive to take from today was that five and a half hours of effort will be a great springboard for future weeks. Many thanks to the organisers for “so many” marshals, a fantastic course (ever hill is a challenge that makes you stronger) and the stunning scenery. 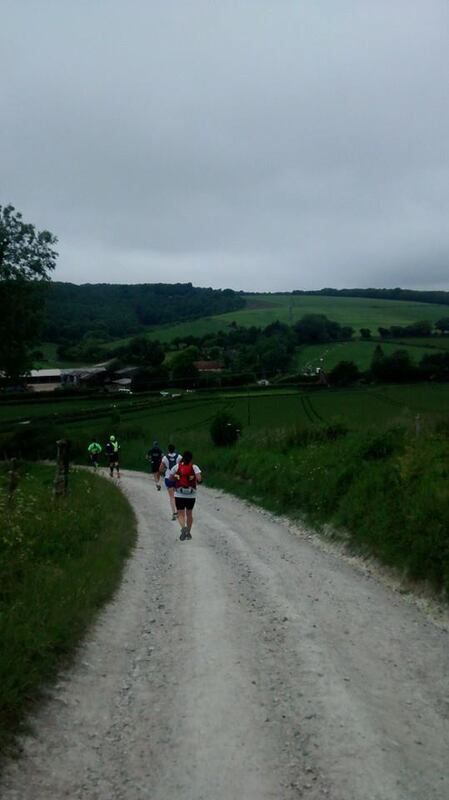 The 3 Forts Challenge is a 27.2 mile trail run that takes in the South Downs Way (SDW)and three Iron Age forts. So, Cissbury Ring 250 BC, Devil’s Dyke 100 BC and Chanctonbury Ring 600 BC mean not only are you in a beautiful part of the world but you feel like you are going back in time as I doubt it has changed for hundreds of years. Crusaders Paul, Sally, Jon, Dave, Lucy and Kate joined my trail running buddy Paul Coates and I on a windy morning along with Phil Hobby from Stubby. Kit choice was going to be important today seeing as we were set for 3,450 feet of elevation and the temperature can drop significantly when you get up onto the top of the exposed Downs. I wore my long sleeve Helly and was pleased I did as well as carrying my Ron Hill waterproof jacket that ties up around your waste because heavy rain for forecast for later. Finally with ten feed stations on route the organisers certainly had the runners interests at heart. Once onto the main trail some concentration was required due to the dry rutted mud and it was here at about four miles that I chatted wit Phil Hall who I know from twitter and have been in the same races but not actually met, so it was great to have a bit of a chat. By six or so miles our days task came into view with the skyline being our target. I’m a firm believer that you get out of life what you put into it and as runners we train for days like this. The sheer beauty of our surroundings coupled with the physical and mental challenge ahead quite simply make you feel alive and highten all of your senses. With 350 + like minded runners the day promised to be a memorable one. As Julie Andrews once sang, “The hills are alive with the sound of runners” … or was it music ?? I’d read on the course notes that 11 miles was a turn around point so it didn’t surprise to to see “speedy” Paul Webster heading in my direction. 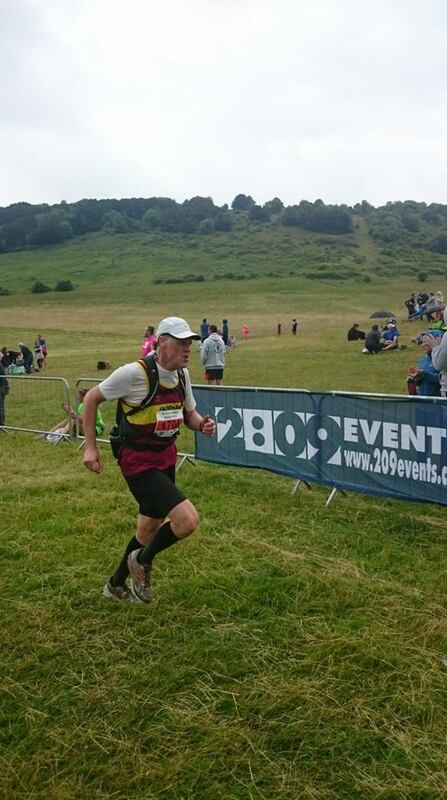 Paul finished an amazing 41st out of 352 so much respect to you Sir. Paul Coates passed me next with a picture of concentration on his face which isn’t like Paul, we usually get a pose of some description. Clearly his 38 mile ultra from the previous week was starting to take some toll on his legs. I turned and fairly quickly saw Sally & Jon on the downhill then followed by Dave, Lucy and Kate. Seeing as I had my waste band open for a drink I took a photo. In many ways hills are a metaphor for life. You keep plugging away with whatever it throws at you and sometimes it feels like you aren’t getting anywhere but when you reach the top and know you’ve reached your goal then the sense of accomplishment is immense. Running can be quite emotional, at points like this, as a wave of self belief sweeps over you and you feel like you are on top of the world (well the South Downs). The last two miles were bliss as the downward trail wound its way towards the finish line. The drizzle that had started at about 22 miles was becoming more noticeable but there was no way I was going to waste the “free miles” of the downhill section putting on my jacket !! I crossed the line in just under 5 hours 7 minutes and in 218th place out of 352 which I was happy with in a field of runners who would have specifically chosen this event. Phil and Paul had both finished ahead of me and Paul Webster was probably at home having his tea 🙂 The remainder of the Crusaders came in through the heavy rain that had developed so well done to them too. Today got the thumbs up from both the lads above and certainly from me too, even if this photo was from before we started ha ha !! 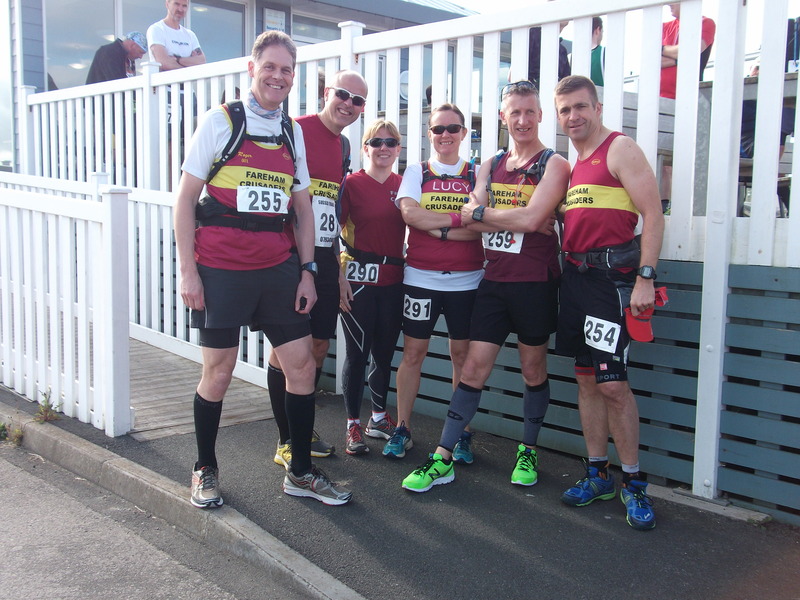 QE Spring marathon : 1,000m elevation in the 26.2 miles !! Today’s marathon was one of those days were it was a pleasure to take part. Second Wind Running (SWR) always put on a great race (I’ll let Phil off with the 26.6 miles as everything else was spot on). The combination of a challenging course (1,000 metres elevation), lots of trail running friends and the March sunshine made it a day to remember. With the marathon setting off at 9.30 and the half at 10.15 there was a lot of activity in the race HQ area. I bumped into Mark from the New Forest as well as Paul, Allie and Richard from Fareham and Ian from Chichester. Paul Jeffrey, a fellow runner & blogger was there as well as Ros, Dean & Kiernan who were out on the course marshalling. It was also great to get a shout out from Fareham’s Mel and Trevor who were just arriving as the marathon set off. Ironically within a mile I was chatting with Thom from Fareham Crusaders who I’d seen on the race entries but didn’t know. We chatted briefly and agreed to train in the future. This pre marathon photo of the two Pauls and Allie shows you what a scenic location we were in. The first 2 miles are largely uphill so the initial banter soon went quiet as we all pondered that this would be the same for miles 13 to 15 with today being a two lap course. Regardless of the incline I could hear lots of people saying how beautiful the trail and trees were as we threaded our way through the forestry commission woods. A group of about ten of us had joined up and as we passed marshal Dean the pace was in line with a 5 hour marathon due to the frequent hills. I chatted with Ian from twitter/Chichester and he mentioned he had a 100 miler in five weeks !! By the 4.5 mile mark we had our first aid station. The group largely stopped on mass so I couldn’t resist running straight through so as to get a head start on the steep incline back out of the park. Today I had two 250ml and one new Osprey 500ml soft flask in my waist belt, these take up less room and work well for me. With five feed stations I only needed to stop at three so it saves a certain amount of time but more importantly you keep on the move !! I thanked Ros for marshalling when I passed her and this took us down a welcome decent for a while. The sun was becoming stronger now and I exchanged places with brothers Simon and Jonny from Pompey Joggers for a number of miles. The Staunton Way took us back into the park with a long drag across the fields as we headed for the forested area. While I took a gel I snapped this photo to give a sense of the long drag. The drinks station at about 22 miles couldn’t come soon enough and I have to say I slowed down as we rejoined the Staunton Way for a second time. The final mile and a half through QECP was quite emotional because I knew I’d had a good run and shared the experience with lots of friends. The sound of a woodpecker echoed through the trees and the smile on my face was getting bigger each hundred metres. My time was 5.07 which I was happy with considering the hills, heat and lack of 20 mile training runs. For a bargain £3 there was chilli con carnie & a roll on offer so I scoffed those down as I chatted with lots of the people I have mentioned. As you saw at the start of my blog the medal and T Shirt were eye catchers and I finished off the day with some photos of the people involved. This is my trail running best buddy Paul, then below me, Ros & Richard. And finally I owe a debt of thanks to Simon and Jonny who kept me on my toes for quite some time, thanks lads. Last but no least thanks to Phil & Teresa from Second Wind Running for hosting a great race and a great day. Lots of complements, I recommend if you are in Hampshire, look them up 🙂 Yes trail running can be challenging but it is also very rewarding. Front left to right, Chris, Gary, Paul, Pete, Howard, Paul, me, Lucy, Rod, Dave and Ed were the 11 Fareham Crusaders that took on the challenge. Endurance is said to be, the ability to endure an unpleasant or difficult process, without giving up. As a marathon runner I can relate to this, however, as an off road marathon runner I can’t see what’s unpleasant about running through our “Great” British countryside on a cold and crisp day with it’s sights and sounds. OK there’s the mud and the hills (800m elevation) and the water logged sections but they are simply challenges to boost your sense of achievement when crossing the finish line. Second Wind Running (SWR) were the hosts of the race and I can’t compliment them enough for the organisation and effort that went into a great day. “Hats off” to Phil and Teresa. SWR even organised the weather !! Saturday’s biting wind had gone and so had the rain from earlier in the week all we had to contend with was the 2 rising to 5 degrees. Now that you’ve got an idea of my approach to this run, lets set the scene. Lucy drove Paul, Pete and me to the marathon “parking field” and it was only a short walk to the Meon Hall race HQ, Meonstock. These East Hampshire Downs and the wider South Downs National Park would be todays setting. Our 133 other competitors were made up of local clubs as well as runners from further afield and Twitter runners @ChiltonDiva, Ben Jarvis and Phil Hall. A special mention also goes to Paul Coates who only had stiches out on Friday but was keen to run. The hall was filled with a mixture of banter and anticipation. After our thorough race briefing from Phil Hoy we were off down a country lane and onto the old railway line via a large puddle. In no time we were being guided onto the South Downs Way (SDW) by Teresa and the lower trail that weaves its way up towards Old Winchester Hill (OWH). I use a technique I call “slip and slide” along these muddy trails i.e. you just follow one stride with the next and hope to stay on my feet !! 4 wheel drive trainers would certainly have come in handy. Paul, Rod, Howard and I scaled some 450 feet of elevation working our way up the hill and as with every good hill we were rewarded with a fabulous view of Beacon Hill across the valley and the Isle of Wight in the distance . It’s fair to say hang gliders and buzzards are equally at home in this area. Pressing on along the SDW we met a mixture of trail and country lanes as well as this concrete path which seemed curiously out of place in such a scenic area. Running in the countryside really is visually rewarding. Next we were heading North and up towards the ridge of the Downs. The approach to this exposed section of the route usually includes cattle but luckily not today. However, the cows trademarks were regularly dotted about in the clumpy grass. Dodging cow pats isn’t a skill you’d practice on running club night but it’s surprising how nimble you can be when the consequences are so shi**y !! The sharp climb up onto the ridge was made more challenging with the clumpy grass but at least there was a clear trail to follow. More styles and gates were negotiated and after over an hour we actually went downhill. The better going underfoot was short lived and it was back into “slip & slide mode”. As we approached the back of Butser Hill (the highest point of the South Downs) I knew we had the most technical section of the route ahead. The 200 metres sharp climb is up a narrow trail that years of water has cut out a V shape in the soil down to the chalk. So at times I was planting a foot at an angle on both sides of the gully. The photo below was from a training recce. Most of us walked this, Howard flew up !! After the lung busting ravine climb a welcome gradual descent took us down to a waterlogged section with “refreshingly cold” water !! It was through this messy section that Pete and Ed passed me, with Pete shouting “just keep smiling Roger”. Harvesting Lane was next on the agenda at 13 miles. This lane is famous as a cycling Strava segment with 300 feet of elevation and gives your legs a different kind of work out after the grassy slopes. Paul and Rod were waiting for me at the top but I insisted they carried on as I knew I was holding them back. I re-joined the SDW and headed across to the Sustainability Centre and the huge houses opposite. Heading down Chalk Lane (photo below) a good measure of restraint was needed what with it being very slippy and uneven. You’d think running downhill would be a welcome relief but were your legs have already been pounded the jarring is actually quite uncomfortable. Unscathed by the bottom of the lane it was a relief to get back onto country lanes. Having recced the whole route I knew the worst of the grass and mud was behind me but there was still one steep lane and a gradual climb across a field to come. Emotions were high as I saw the 20 miles come up on my garmin especially as I knew the last 2 miles drop down to the finish. I was starting to get cold now after being out for some time but the thought of post race food and drink drove me on. Hydration drinks and gels do their job but they aren’t the same as a hot soup. I mainly walked the steep lane with flurries of running. Another of the excellent marshals spurred me on as I crossed over the road and onto a track across the fields. The next downhill section again caused me pain but that’s when the thoughts in your head need to be strong, after all you can’t walk downhill !! I managed a slow but purposeful crossing of the gradual uphill field and this brought me to about 23 miles and the prospect of finishing. The sun was getting lower in the sky and the wind had started to pick up so it was time to press on and finish what I’d started. At about 25 miles I was aware four of our Crusaders were closing in on me !! I couldn’t fend off Dave Fuller but was pleased to retain my 75th position out of the 130 finishers. On arriving we were greeted by most of our quicker Crusaders who were waiting to cheer us in. I stopped my garmin at 5.10 and grabbed the first chair I could see. Rod came over and offered me the second half of his soup, I really appreciated that Rod, thank you. I picked up my excellent medal and we all congratulated each other on a hard but hugely satisfying run. We knew Gary was still to finish but he would also be welcomed in a little while later. A great effort by Gary who only entered on Saturday. I asked Chris if this trail marathon meant he’d be doing more but I think he’ll be sticking to triathlons. I have to say I was shattered but also on an extreme high of achievement. This is my 10th and probably hardest marathon what with the cold added in and even though this may read as hard work, it was enjoyable hard work. Paul had a “First wounded” award that Phil had made especially for him (the stiches were from a SWR recce run 2 weeks earlier) which was a great thought. I’m sure we will all be back next year. Huge thanks to Phil & Teresa’s Second Wind Running organisation and marshals, also to my fellow Crusaders for making today a memorable one. 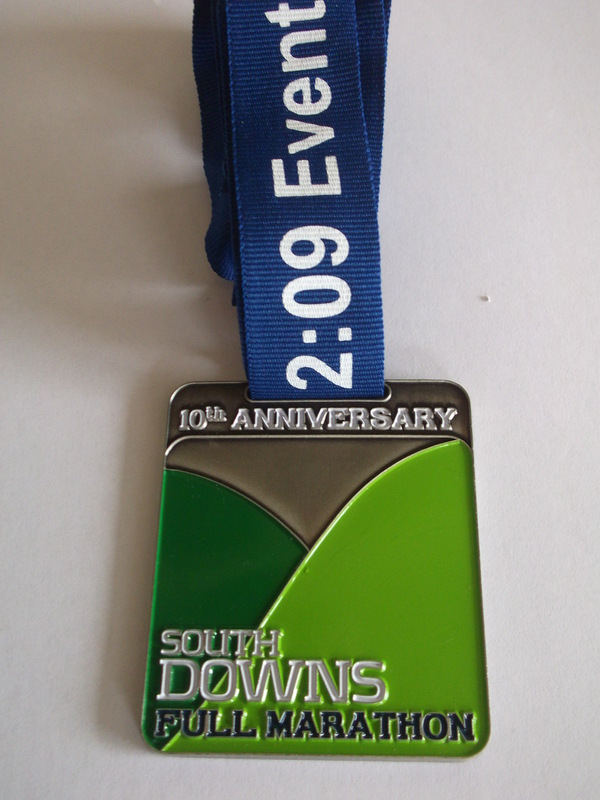 South Downs Trail Marathon : 26.2 miles of Hills & countryside – all the good stuff !! Paul Coates, Lucy P, Dave Fuller and me. As we left the grounds of Slindon College Paul quickly disappeared into the distance while the 3 of us got into our stride along some narrow lanes that then started to gradually climb from a mile or so in and with only the exception of a short flat section the gradual climb carried on until mile four. It’s not too often that you see people walking in the first 3 or 4 miles but with 3,300 feet of climbing in total the tactics of, when to walk and when to run, would come into play. I ran most of the first 4 miles and was pleased to reach Glatting Beacon at 5 and the first drinks station. Part of the enjoyment of today was running through areas I’ve seen photos/videos of while looking into the South Downs Way (SDW) generally. The fact that you have to run up numerous hills means two things to look forward to, the views at the top and the downhill that follows. Strangely the up hills seemed to outweigh the downs but the miles of lush green countryside, the cooling wind on the higher ground and the relief of the descents are all part of the package. 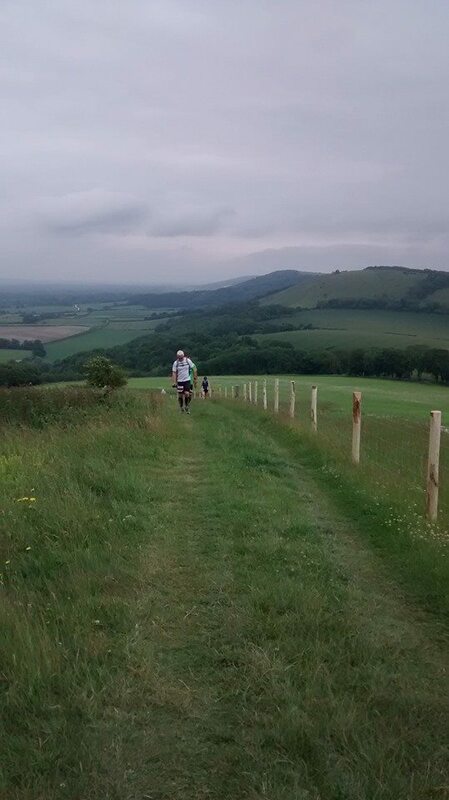 The SDW is a mixture of obvious chalky lanes, less obvious tracks through fields and grassy trails across the top of the Downs, they all have one thing in common, it’s beautiful up there. Dave kindly took these photos for me as him and Lucy were on more of a training run ready for the 100K Race to the Stones in 3 weeks. Concentration is another feature of running off road, you have to keep your wits about you so as not to stumble and also keep an eye out for mountain bikers too. By half way I was at 2 hours 19 minutes so a sub 5 hours was on the cards. With the A286 crossed this meant Cocking Downs and yet more steep lanes and tracks that also included “quick marching” when running was beyond me !! The sun had come out by know so it was “cap” time and water over your head 🙂 I do remember thinking how a hard day would have been so much harder if the sun had been beating down. 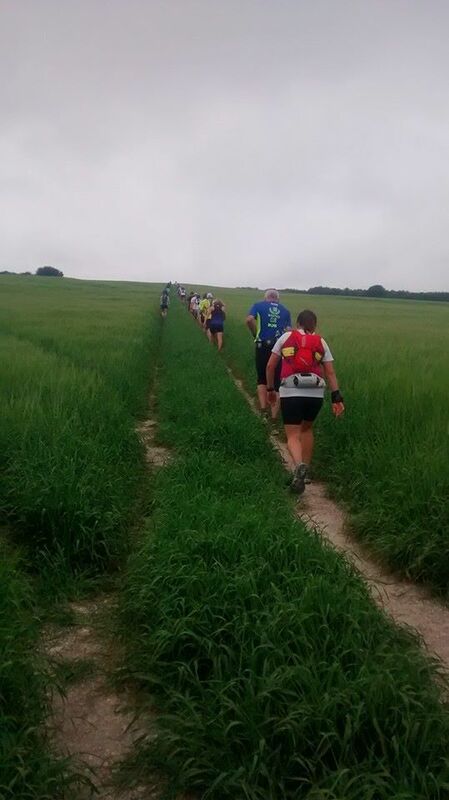 The next prospect in store was Harting Down and it’s two big hills on the way to 20 miles. With hardly a spectator in sight this marathon does rely on your inner motivation, however, the cheers as I, and I’m sure everyone else, went through the 20 mile feed station were much appreciated. Kate Bush once sang “And if I only could, I’d make a deal with God, And I’d get him to swap our places, Be running up that road, Be running up that hill, with no problems”. Personally I wouldn’t have swopped running up those hills with anyone today. 329th place out of 500 and 4-58-38 meant sub 5 hours and my marathon mojo back. Well done to Paul who was 105th in 4-11 and Dave & Lucy who has it turned out were very close behind me.